Nothing tastes better on a hot summer day than a homemade ice pop! But you don't have to settle for the store-bought ones or ice cream truck varieties that are loaded with refined sugar and artificial colors. Make delicious homemade popsicles out of tasty pureed fruits and juices with this Set of 4 Silicone Ice Pop Makers. 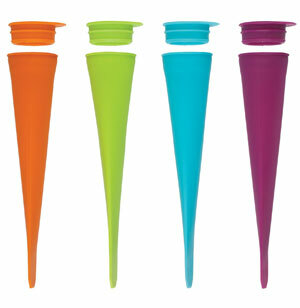 These neat squeeze style pop makers are easy to use; just fill, seal, freeze and enjoy! Their slim design means they take up less space in the freezer and their silicone sleeves mean less mess for little ones!